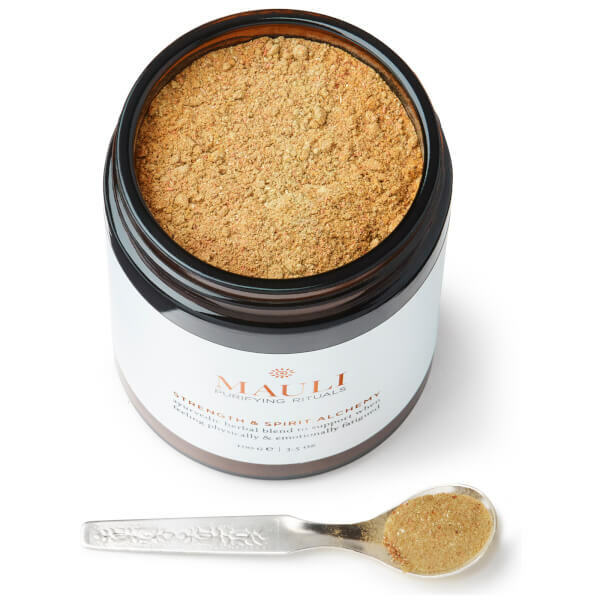 Developed for those feeling physically and emotionally fatigued, the Strength and Spirit Alchemy Blend from British beauty and wellbeing brand, Mauli, is famed for its all-natural and organic beauty treatments based upon ancient Ayurvedic principles. Packed with nutrient-rich ingredients, the powdered blend is formulated to balance ‘Kapha’ (one of three biological energies or ‘dosha’ found throughout the human body and mind that govern all physical and mental processes). Kapha dosha is energy that governs the structure of the body, supplying water to moisturise the skin and support the immune system. Ashwagandha – a potent Ayurvedic herb known as ‘Indian Ginseng’ that helps alleviate feelings of anxiety, stabilise thyroid production, improve sleep patterns and enhance virility. Turmeric – an antioxidant-rich root that purifies the blood, remedies skin conditions and provides anti-inflammatory properties. Manjishtha – a rejuvenating Himalayan plant that helps support the lymphatic system, reduce inflammation and improve circulation. Nagarmotha – an anti-inflammatory herb known as ‘Nut Grass’ that helps maintain gastrointestinal health and promotes healthy function of the digestive system. Moringa – an antioxidant and a rich source of iron, calcium and vitamins A, E and K that strengthens the immune system and supports maintenance of muscle mass. Ashwaghanda (Withania Somnifera), Moringa (Moringa Oleifera), Nagarmotha (Cypres Rotundus), Manjistha (Rubia Cordifolia), Tumeric (Curcuma Longa).